Now begins another adventure in placing Urantia Books. Our library-placement team, consisting of four members, put a copy of the English book on a shelf in a ship’s library. The next day we saw a gentleman looking at it. Hooray! Serendipity or…? Joseph, a gentleman from New York, moved to the Dominican Republic to open a school for pregnant teens. His service was motivated by the fact that these girls were not allowed to attend regular school. Joseph soon found himself engaged in teaching young men and women English for the purpose of supporting themselves as tour guides. This school is housed in an open air thatched roof “lean to” in the jungle, three hours from the capital of Santo Domingo. Upon learning of our quest, he volunteered to take El libro de Urantia to the nearest library in Santo Domingo on his next trip there for supplies. We hope, of course, that, before placing the book, curiosity might compel Joseph to peek between the covers. Our next ports were the Dutch-speaking Antilles. In preparation we had asked Henk Mylanus, a Dutchman and trustee of Urantia Foundation, to write a letter of introduction to Dutch librarians. We learned that this formal letter of introduction elicited appreciation and respect for our donation of Het Urantia Boek. We immediately began to accompany all of our Urantia Book donations with introductory letters. Another serendipitous experience was our meeting with Sue, whom we encountered as we paused to look at a map. She is a resident of Bonaire, Antilles, and is an avid reader, who informed us that most people in Bonaire use an exchange library. She then volunteered to put Het Urantia Boek in this library the following day. Will her curiosity move her to peek between the covers? Curaçao, Antilles, has a large, modern, busy library. The majority of patrons appeared to be teens and young adults. A security officer phoned the director to meet with us, and he appreciated the quality of the Dutch translation and was happy to add it to the books in the “religion” section of their library. 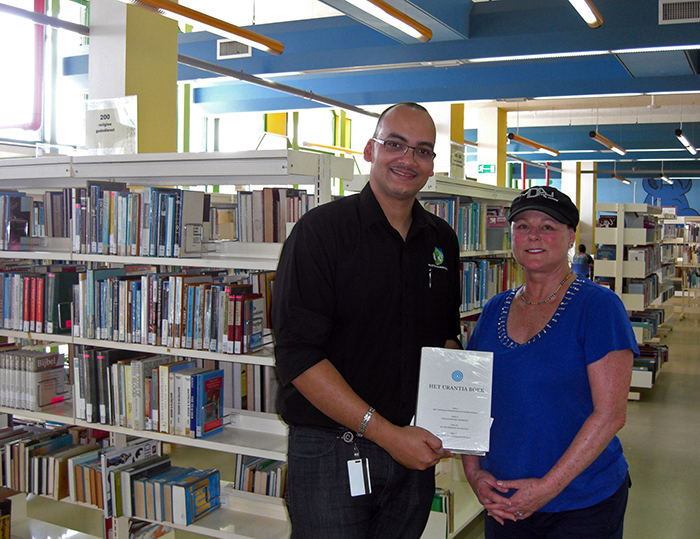 A third Dutch translation was placed in a highly busy and modern library in Aruba. The director graciously accepted the book, had our pictures taken to put on their website, and declared an article would be written for their newsletter regarding our donation of Het Urantia Boek. We arrived in Phillipsburg, St. Maarten, the Dutch capital, depleted of Dutch translations. Undeterred, we drew upon our stock of French translations (the other half of St. Maarten Island is French), grabbed a taxi cab, and headed for the French Capital, Marigot. While at a pharmacy, we asked the clerk about the location of the library and learned that it had been moved a considerable distance away. We told her we had a book to donate. After pondering our statement for a few moments, she made a phone call and gave us directions to the office of International Organization for Youth Affairs. It is a cultural center where young women and men are trained in the art of government. Pricilla Bade, the director, gave us a warm welcome. She assured us that Le Livre d’Urantia would be put in the library. Once again serendipity seemed to follow our determined footsteps. On the way to the library in Barbados, we encountered a long parade of schoolgirls, their mothers, and a marching band. They were chanting slogans, singing, and carrying banners calling for equal rights for women and an end to violence against women. Once at the library, we were warmly welcomed by gentlemen at the front desk and swiftly escorted to the administrator’s office for a grateful reception for our donation of The Urantia Book. In Fort de France, Martinique, the Schoelcher Library is a building of magnificent architecture. It was built in France, then taken down, then shipped piece by piece in the late 1800s, and then reassembled in Martinique. Much to our dismay, we had no more French translations. Not to be defeated in our purpose of seeding The Urantia Book in all the ports we entered, we met the administrator of the library, got his name and address, and shall mail him a copy of the book for placement in this historic library, which is on the “must see” tour lists. 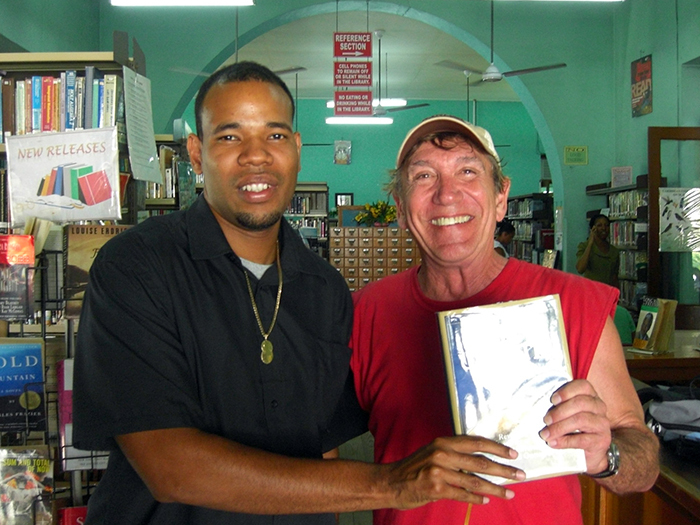 Circumstances were such in Roseau, Dominica, that half of our team, Bill Beasley and Bernie Gingra, walked into town, found the library, and placed the book with a grateful librarian. This was the smallest library encountered, yet it still had about a dozen patrons reading books. Next stop was Charlotte Amalie, St. Thomas. Here we found a very large down-town library that was closed. A locked, beat-up book drop was next to the chain-locked gate. As I dropped a copy of The Urantia Book into the book drop, it occurred to me that this may be a wasted Urantia Book. Then I remembered that this revelation is truly the project of our unseen friends, and that we are only the privileged and transient actors. They will work their wonders, using whatever tools are available. On another positive note, our taxicab driver, an older woman, overheard us discussing The Urantia Book with some fellow passengers and was interested enough to ask for its name in writing so that she could find it in the library. Wow, our unseen friends certainly work fast! We are now en route back to Ft Lauderdale, Florida, at the end of an exciting adventure seeding Urantia Books in the Caribbean. Our last effort on this trip was to leave The Urantia Book in the ship’s exchange library in addition to the one already placed in the reference section of the ship. This trip has pleasantly surprised us by the many young readers in libraries. The enthusiastic reception of The Urantia Book and its supernal teachings brought hope and joy to our souls.